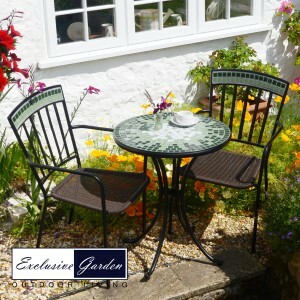 We are delighted to bring you the new Exclusive Garden brand. Currently we have 6 sets of furniture from this high quality range that are “in preview” for 2016, with more to follow early next year. 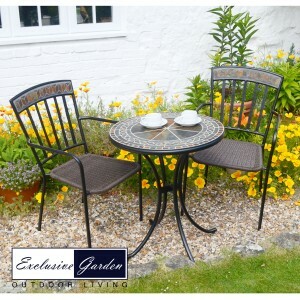 The sets feature tables with hand cut natural slate stone that is laid, again by hand, in intricate patterns. The stone has a riven finish so has the ripples and groves of the natural stone. 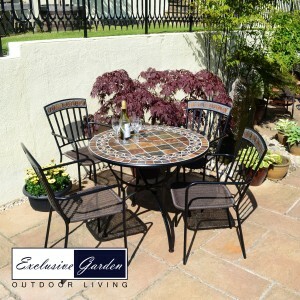 The shades of the stone vary for every table, so no two are alike. 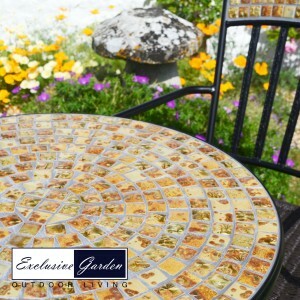 Another table in the range features warm mottled mustered colours ceramic tiles that add a hint of the Mediterranean to your patio. 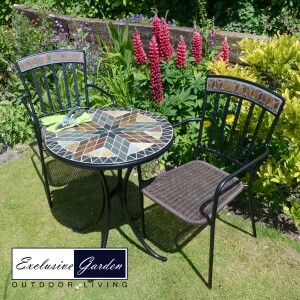 All the stable and chairs have steel frames with are e-plated and then powder coated black, the chairs have weather resistant hand woven seats that make these far more comfortable than a solid seat chair.